how good is the quality of new faac 1.29 (2017-07-17) ? Re: how good is the quality of new faac 1.29 (2017-07-17) ? Sounds promising. I will check it later. 1.29.8.2 is very fast, to the point I'm running out of the legend space! However, I've got many errors while playing the output on foobar2000 v1.3.15. It happens on many bitrate settings, on many tracks including white noise, sine waves, and music tracks. Very interesting finds. Could you upload a couple of those corrupt files somewhere. Never mind. There were a couple of relevant bugs actually and I think I quashed them all. I'm afraid I have a plan to speed it up even more, like several percent. Maybe you could remove faac-1.28 and put legend to the bottom. Contrary to popular belief PNS is not that bad. It's more subtle than SBR and allows to throw some noise here and there unobtrusively. Overall, it sounds better than I expected. Look at this! The new version is even faster! Tried to use the latest 64-bit version for windows 1.29.9.2. Conversion speed is impressive on my sample file shows about 130x encoding speed. However, there is a major issue with raw input (PCM) on 64-bit, after encoding sound is corrupted, i can hardly hear the voice which is almost suppressed by noise. Older version i have (1.26.1 32 bit) works ok (but speed is about 25x), 32 bit version 1.29.9.2 works ok, but shows the speed about 22x. My sample file: 2 channel 44100 decoded from 160kb mp3 file. packaging stream to wav and passing it to faac as stream via pipe and as file (omitting -P), works well. I tried to produce pcm file via ffmpeg and via my program - neither works. For me packing to wav not an option, are there any other ideas? I just released faac 1.29.5 with a few real changes. 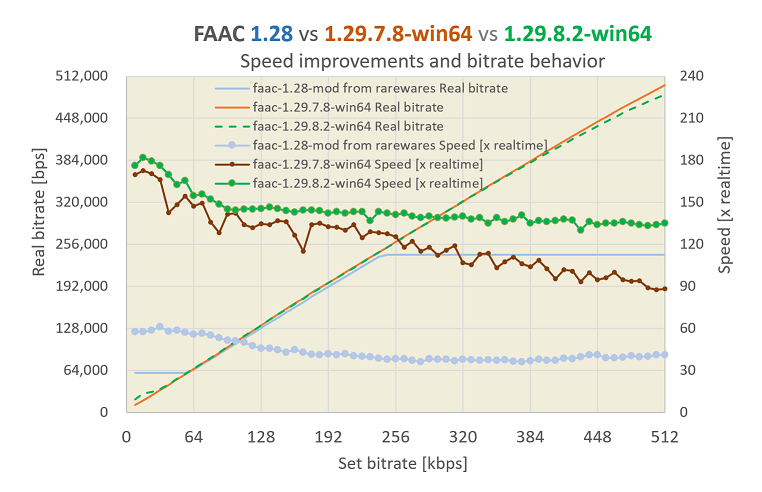 Encoding is definitely much faster and quality may also be better with many samples, definitely worth trying. Also, I just noticed there is noise coding available and it always was a part of standard AAC LC. Apparently I totally missed it back in the days. I will try to develop this thing for upcoming releases, it can give a real quality boost, especially at lower bitrates. Wow, and it seems I totally missed this posting, knik! Just downloaded the new FAAC version, might even check it with ye olde listening test samples. Also very nice that Audiocoding.com is back up again, did Menno do that? Maybe the old Audiocoding site wiki is still available somewhere as well? Neither Sourceforge nor GitHub has one, HydrogenAudio only a short one. 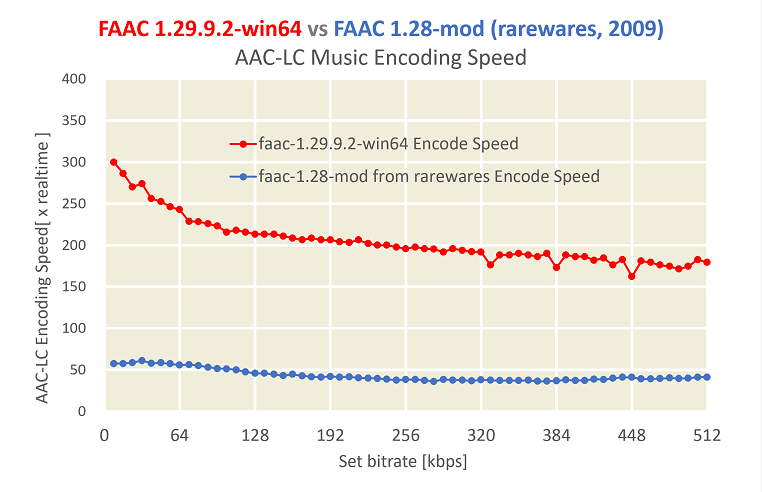 Last but not least: does YouTube still use FAAC for AAC/MP4 encoding? did you just bump 2 year old thread? Why use faac if it can use better FDK-AAC ? where can read about it ? Which encoder provides the best quality? No. Youtube doesn't use neither FAAC nor FDK-AAC. Most probably it uses coder licensed from FhG, identical to proprietary FhG-AAC coder from Winamp (not FDK). https://audiophilesoft.ru/publ/my/youtube_audio_quality/11-1-0-285 (The article is quite old. But as far as I can guess, the AAC encoder on Youtube has hardly changed since then). "how good is the quality of new faac 1.29"
any test with 1.28. * will be deprecated.